Item: With three new starters, four freshmen seeing a decent amount of playing time, and three games away from the Dome, it’s likely only a small fraction of Orange Nation predicted that SU would be 9-1 after the first 10 games of the season. Did you see that overtime comeback from 13 points down in the second half coming against Georgetown last Saturday? After all the Hoyas had SU’s number the last two seasons in D.C. and the Dome, and following a week off for final exams this time around the ‘Cuse came out sluggish in front of the partisan crowd that engulfed the bulk of the lower bowl at Capital One Arena, trying to help will GU to remain one of a half dozen unbeaten teams in Div. I play. 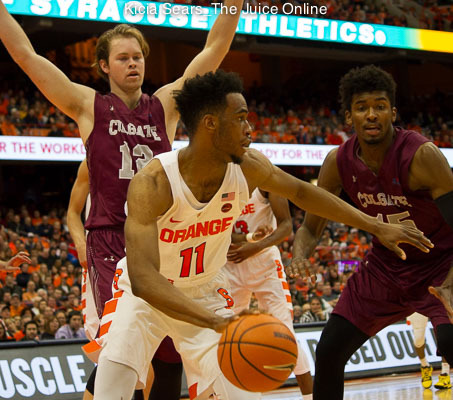 But this year’s Syracuse team, despite its youthfulness and growing pains among its big men down low has talent and experience where it counts the most; in the backcourt. 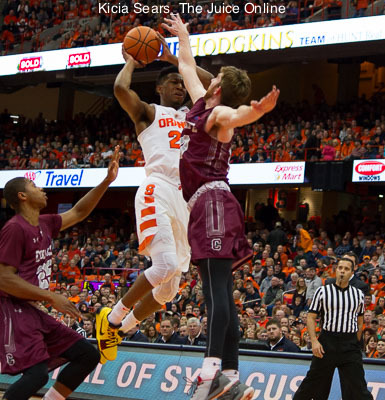 The play of Tyus Battle and Frank Howard has carried much of the weight in leading the Orange with only three games to play before the ACC portion of the schedule kicks in, continuing with tonight’s meeting against Buffalo (7-3) at the Dome (7:00 p.m. ET / ACC Network Extra). In particular Battle, the ACC’s leading scorer (21.5 ppg) by a fraction over Duke super frosh Marvin Bagley III, has been virtually unstoppable in the clutch moments of the first 10 games, and his long range three point bomb on the first possession of OT against the Hoyas put SU ahead for good. “I have to stay aggressive and attack,” Battle said after Saturday’s victory, simply describing his season-long approach no matter what the scoreboard reads. Running the show and growing in each of his three seasons in the program, Howard has provided the perfect complement to Battle’s scoring prowess by finding his open teammates for baskets (third in the ACC with 6.3 assists per game), and buckling down at the top of the zone defensively (second in the league with 2.2 steals per game). Rounding out the big three of Orange statistical production is SU’s own prodigal freshman. Oshae Brissett has already become an opponent’s matchup problem with his versatile inside/outside game registering double-double performances in half of the 10 games, exploding for 24 points and 15 boards playing all 45 minutes against Georgetown good enough to be named the ACC’s Rookie of the Week. “I feel like I am getting a lot more comfortable,” the always cheerful Brissett said after his best collegiate performance. Like it’s late comeback against Georgetown, slowly but surely Syracuse is climbing in the national rankings gaining weekly respect with each accompanying pre-conference win.